August 1991: 2 a.m. I am driving to the hospital to do a craniotomy. I am not thinking about surgery. My mind is preoccupied with getting there. Because of a mistaken short cut, I am completely lost. I end up on a deserted street with burned-out buildings and vandalized abandoned cars. It is scary quiet. The streetlamps are shards, the pay phone is cracked, and I shouldn’t be here. I am disoriented. My hands shake as I unfold a map and strain to read the graffiti- disfigured signs. Headlights appear in the rearview mirror. A sedan with tinted windows is coming. I’m no longer in normal sinus rhythm. I continue down the street and stop at the red light. The sedan pulls close to the side of my car. They can see me, but I can’t see them. I inch my car forward. The sedan follows. The red light is endless. I panic and stomp on the accelerator. The sedan gives chase. I am scouring the streets for something, anything familiar. And there it is: Dunkin’ Donuts. Open 24 Hours in lifesaving neon. I pull in. The clerk knows that look on my face. He bolts the entry door. I lay my map on the counter. He marks the way. I arrive at the hospital and nearly hug the circulating nurse. There are 15 Level One trauma centers serving the five boroughs of New York. Manhattan has four; the Bronx, Brooklyn and Queens have three each; and Staten Island has two. During my more than two decades of practicing in the city, I have worked at seven trauma centers in every borough except Staten Island. 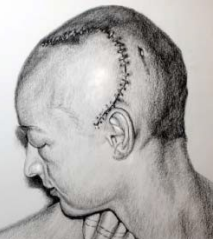 I also have attended neurosurgery clinics in several non-trauma facilities. The New York City Health and Hospitals Corporation provides a significant proportion of the care in these hospitals, including my current posting at Harlem Hospital. Although each has a slightly different mandate, the unifying element of my experience is that each is located in an impoverished and high-crime neighborhood. Excluding Bellevue Hospital, which is affiliated with New York University and Elmhurst Hospital Center (a Mount Sinai Hospital affiliate), the other “city” hospitals have no neurosurgery residents. They rely on either general surgery staff or other midlevel practitioners for in-house support. Over the years, some of the areas have changed or gentrified, and the hospitals often evolved with their neighborhoods. 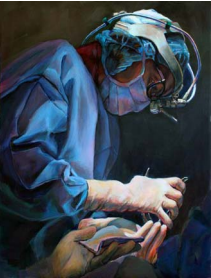 Craniotomy in G Sharp (Acrylic on canvas) by Kathryn Ko There is a seasonal cadence to the work. Memorial Day through Labor Day is considered the summer “trauma season.” It is heavy with neurosurgical emergencies. Trauma season means that weekends and nights likely will be spent in the operating room managing a variety of cases that encompass the total spectrum of human violence. We expect to encounter injuries from bike or car accidents, gunshot wounds, blunt trauma and spinal trauma. These are in addition to the daytime elective operations. It makes for full volume, around-the clock surgery. The cooler temperatures bring a reprieve from trauma season. A more relaxed tempo pervades the winter months as more elective cases fill the operating schedule. My case mix tends to reflect the seasons. Many of these hospitals lack the latest technology. I often have to use an older generation tool or instrument. The case can be completed smoothly, but operating under these resource constraints is less convenient. Limitations are overcome with extra work and middle-of-the-night problem solving. It is rare to be assisted by a dedicated neuro-trained team. Learning to trouble shoot and have several plans is mandatory. Working with limited resources has taught me to be flexible. When necessary, I discard traditional solutions in favor of what is possible at that particular facility. My art background, which illuminates an entirely different perspective, has helped me envision apathy through some of these obstacles. Setbacks become an invitation to switch thinking from neurosurgeon to artist to find a potential remedy. For example, I observed at one hospital that a properly pressurized pneumatic cranial drill emits noise in the key of G sharp. A half note above or below will result in the malfunction of this particular instrument. An audible test prior to the incision alerted us to a potential problem. Painting improves my ability to conceptualize in three dimensions. It decreases my dependence on neuro navigation and is a valuable asset when this technology is not accessible. Other neurosurgical colleagues have their own unique strategies, and I have drawn strength from their persistence and passion. Our patients speak every language, from Albanian to Urdu. They come from not only New York’s minority and socially/economically challenged populations, but also West Africa, Mexico, Central and South America, Eastern Europe and Southeast Asia. Translating services are, therefore, in heavy demand, and speaking Spanish is definitely a timesaver. Commercial or private insurance is a rarity in my practice. Had it not been for stipends from the hospitals, I don’t suppose any of us could continue. I am grateful to the army of medical professionals who through the years teamed with me and buoyed me through the difficult periods. And surely, without art, I may have succumbed to burn out and retreated to a different practice. 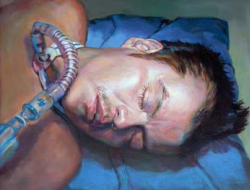 Painting provided a place to put these experiences and capture the truly authentic lessons that are dismissed in the stress of a hectic hospital day or decade. 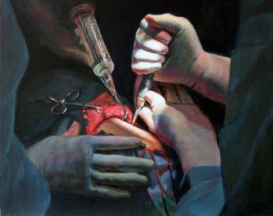 Coupling my neurosurgical career with my art saved me. January 2013: Midnight. I pack technology. I have a Droid, and my car has a GPS. I’m driving north through Harlem. I cannot get lost. Truth be known, I still grumble about the late night dash to the hospital. But these days, it is softer and toned down by my affection for this place. After the operation, I pass my favorite Dunkin’ Donuts — for me, a sentimental symbol of security. Always open just in case. This dawn, I stop in. The overnight manager knows that look. “Hard night, doc?” she asks. Kathryn Ko, MD, MFA, FAANS, graduated from the University of Hawaii School of Medicine and completed her neurosurgery residency at Mount Sinai Medical Center in New York City. 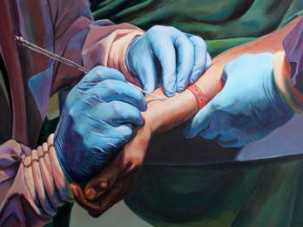 She holds a Masters of Fine Art in painting and practices at Harlem Hospital. The author reported no conflicts for disclosure. Bon Voyage Pan Am pines for the bygone era of air travel when flying was special. Aviation was magnetic with thunderous take offs. Fashionable stewardesses in silken scarves sashayed down the aisle as though on a catwalk. From gloved hands came the offer of sophisticated drinks in crystal glasses. Cheese appetizers were carved with silver-plated knives. Flying was exciting. The fuselage was energized by the anticipation of adventure and smiles were all around. Once at cruising altitude, passengers relaxed under the spell of the Boeing engines thrum and napped contentedly. Their collective snore transformed the cabin into our den. It felt safe. No single airlines typified this combined sense of adventure and security more than PanAm. It came to represent America to the world in a rarefied mingle of technological prowess and glamour. In its heyday, Pan Am boasted it made the world smaller by taking Americans to every foreign continent except Antarctica. The images that circulated in the world mediascape promoted the idea of the American Dream in each hemisphere. The logo was so recognizable and iconic it was featured in several major movies including, 2001 and Blade Runner. 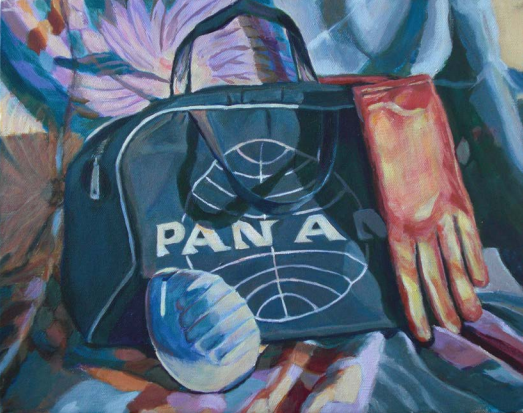 Pan Am was America’s global ambassador and its passengers friendly agents in this mission. Marshal McLuhan noted that the media of that era created a global village and technological advances such as air travel diminished the interposing physical distances. On December 21, 1988 Pan Am Flight 103 left from London bound for New York. Over Lockerbie, Scotland, it was destroyed after an onboard detonation of plastic explosive. Based on the flight manifest and the ground tally, 270 souls were lost. In the frightfully illogical icescape that was germinating, Pan Am, one of the cultural icons of the 20th century and the unofficial flag carrier of the United States, was under threat. Pan Am, standing in as the United States allegorical twin, became a target for terrorists. As the company was forced into bankruptcy in 1991, the subtle cracks in air travel commenced to fissure. We barely knew it then, but this and similar events hinted at the future of aviation. In a cruel reversal of the American Dream our proud symbol would be turned against us and in the long march to awareness the imperceptible steps toward a political nightmare had begun. The painting delivers a set of contradictions based on real events and hovers between the past and the current, the political and the personal. Media’s images and ideas whirl around the map at laser speed but we passengers of this planet, limited by our biology, mark time in the finite adagio of a lifespan. Our final migration often ends not with a crash but with the sound of eyelids closing. When that night comes, I pray I dream of flying.